Ramesh Raskar and I are teaming up with Doug Hart, Joe Jacobson, and John Werner to run our expanded and enhanced MIT Imaging & Fabrication Ventures seminar Tuesday mornings this Spring 2014! This is an Action Lab class designed to help students conceive of and launch great startups. We study the landscape of imaging developments, plan and prototype new ventures & products, and brainstorm towards a startup, business unit, non-profit or citizen sector organization. To bring imaging research to the real world, the students will be encouraged to build teams and craft a business plan. We'll be exploring venture opportunities in some of the fastest changing technology domains including all things Imaging -- e.g. cameras, displays, visual computing, analytics and apps -- and Fabrication -- including robotics and automation, rapid prototyping, smart customization, 3DPrinting, DIYkits, peripherals and accessories to mobiles and tablets, fast venturing, crowdfinancing, issues of local and global sourcing and more. Please spread the word to those you think might be interested. 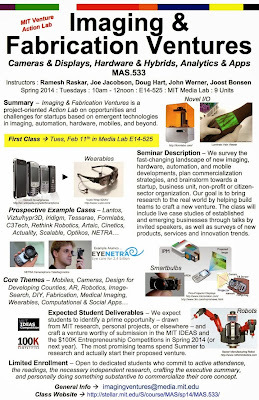 First class is next week Tues morning February 11th, 2014 in Media Lab E14-525.